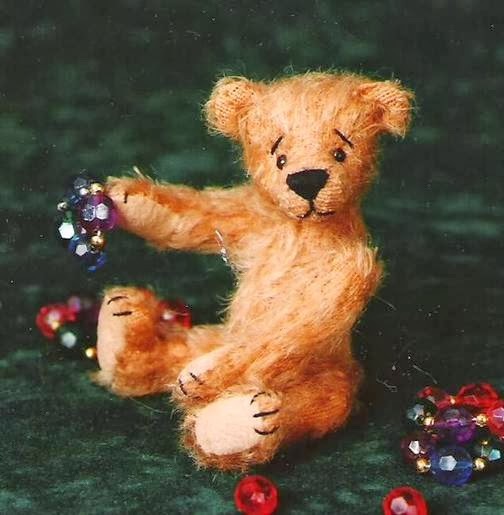 Megan's Tiny Treasures: Project 52 - Miniature Bear Making - Let's get started! Project 52 - Miniature Bear Making - Let's get started! A project 52 is just the thing when you are stuck for creative inspiration and need a kick start. If you Google Project 52 you will see how thousands of artists are using this technique to help grow their creativity. Noah Scalin wrote a book about his even more ambitious Project 365... I bought the book, but whenever I think of starting something that big, I need to go and lie down for a while... maybe next year. Some time ago I came across 52 Reasons I Love You. Now I don't have a romantic hair on my head, never mind 52, but this project blew my mind because of the format in which it is presented. There are 52 weeks in a year, and 52 playing cards in a deck. Playing cards are the exact size (2 1/2 inches x 3 1/2 inches) of Artist Trading Cards, which is another of my hobbies. Sudenly all the dots connected, and I knew that this would be how I present my very own Project 52. So, this is notice to get ready to get started if you want to join me for 52 weeks of miniature bear making. In order to participate you will need the pattern for Angus, which you can find on the Tin Soldiers website, or in my Etsy shop. Once you have the pattern, you will be able to apply the miniature bear making techniques that you find here on the blog. You will need an assortment of short pile mohair, felt, velvet and cotton fabrics and general bear making supplies. I'm not going to limit your choices or suggest that you buy stuff specially. See how far you can get with what you've got. You will need a deck of playing cards. Don't use one that you feel sentimental about, or a very expensive pack. We will be messing it up. Every week we will add one page (a playing card) to our deck of miniature bear making techniques. After 52 weeks, you can use them as flash cards to remind you of the techniques and store them in a box, or bind them in a book. I'm looking forward to this year long journey, and I hope that you will join me. What a fun 52 weeks to look forward to, thank you. Thanks Joyce, it's going to be fun sharing these techniques with you! Wow, this is awesome. I'm in, looking forward to the next 52. Happy that you will be joining us Jeanette, this is going to be a fun project! Good things come in small parcels. I'm sure your teeny bears will be beautiful. Even if you are not a miniature bear maker, Kay, I think some of the techniques might be useful to you. Being an old hand though, you probably know it all! Oe, ek sien so uit daarna, Megan! Dankie, Tharina. Dis darem 'n manier om bietjie uit te reik na jou! Just the thing to get me back to crafting regularly. I'm excited and hoping we start on Thursday - thanks for showing the way as always Megan! Aurora, I'm sure by now you've made 104 cards... painted all my edges this morning, now I'm going to work on the panda for a little while. I am in too, thanks for sharing your ideas!! Great, Lee! Thanks for joining us. Painted all 52 my card borders this morning, on both sides! I think I'm ahead of the game now, will have to see how long it lasts. Yes, 52 hours to the day sounds like a good idea, we should vote on it.